The leaf of the Peruvian Graviola tree was discovered nearly 25 years ago as a wonderful way to prohibit abnormal cell division – in other words, cancer – and similar diseases of metastasizing, unhealthy cells. Graviola contains cytotoxic compounds that destroy cancer cells with ‘lethal precision’ while leaving healthy cells unharmed. By seeking out cells higher in the production of ATP, this tree’s natural compounds are able to kill cancer cells and leave healthy ones alone. Graviola has been tested widely in over 20 labs since the 1970’s, but many of the results have not been published (or released to the public, more likely). But the National Cancer Institute confirms that the tree’s active compounds attack and destroy cancer cells exceptionally well. It has been shown to be effective in treating malignant cells in 12 different types of cancer, including colon, breast, prostate, lung, and pancreatic cancers. Compared to a commonly prescribed cancer drug, Adriamycin, often given to chemotherapy patients, Graviola is said to be 10,000 times stronger than the drug at halting cancerous cell division. These results were confirmed at the Catholic University of South Korea and published in the Journal of Natural Products. Purdue University has also found that Graviola leaves are anti-tumorous. 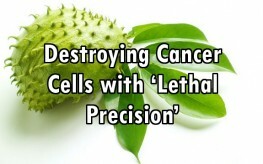 Even tumors that were resistant to chemotherapy treatments responded well to the active compounds in Graviola leaves. The reason you likely haven’t heard of this cancer-killing winder is the same reason thousands of other natural therapies are suppressed. Unless they patent the tree compounds, pharmaceutical companies can’t make a dime off of cancer patients. It is currently illegal to patent naturally occurring chemicals, and since Big Pharma would have to reproduce several annonaceous acetogenins in the laboratory to hopefully get the same results as the natural Graviola compounds, we have yet to be introduced to a ‘Graviola’ drug. But why bother – the natural compounds work just fine – as proven in laboratory tests. No one needs to spend thousands on synthetic acetogenin when Mother Nature gives it to us for free. Graviola is also called soursop and guyabano, or the scientific name, Annona muricata. While the fruit-bearing tree can also be used medicinally by utilizing the fruit, roots, and bark, the leaves themselves contain the highest concentrations of the active ingredient, acetogenin. Soursop also helps with endocrine system problems, and supports the liver, kidneys, thyroid, pancreas, intestines, gall bladder, ovaries, and prostate. It has even been shown to reduce brain tumors and halt breast cancer. The tree grows all over Mexico, Cuba, the Caribbean, Central America, and northern South America. Check out other guyabano health benefits here. Graviola does have a few contraindications. Pregnant women should not take high doses since a fetus also produces high levels of ATP (like cancer cells), and the seeds and roots can be neurotoxic, where alkaloids are highest in concentration. The leaves and pulp of the Graviola fruit are safe; however, and the leaves contain the highest levels of acetogenins, anyhow. Wow! Thank you for all the life saving information you provide to us. It’s a sad state of affairs we’re in with Big Pharma, the FDA and and the ACS….an unholy trinity to say the least! I recently had a friend go through a radical mastectomy without reconstruction due to her insurance, and it’s heart wrenching to see someone go through that process, not to mention the needling thought that there, but for the grace of God, go I (or other loved ones), at any moment. Wouldn’t be wonderful if we could finally wrestle the megaphone away from the powers that be, and get this information about graviola into the public consciousness?! Imagine, we could greatly improve the economies of many people in Mexico and other Latino countries simply by them supplying the world with this super fruit and others! We may see the drug trade collapse and the rise of specialty “agri-pharms”! See what I did there? I’ve coined a term for a whole new life saving industry! Seriously though, if we ever want to see the end of cancer as the killer it is today, we have to pull the financial plug on the usual suspects and turn to the scientific community that is based in the naturalGod, given drug store. I would love to be a part of that revolution! How can we spread the word on this and wake the masses from their slumber?